Hi friends! Some of our favorite comfort foods for cold weather! Gluten Free: Besan/ Chick pea flour doesn’t contain gluten, so it makes a good substitute for wheat flour in gluten-free diets. In a pan put the sugar and water and bring it to boil. Keep on simmer, till required. In a wok/ Kadahi, melt the ghee add the Besan /Chick pea flour and stir fry over medium heat, stir it continually for about 8-10 minutes. When the Besan /Chick pea flour is a light golden in colour and does not stick together much , it is well fried . Pour the hot sugar solution into the fried Besan /Chick pea flour gently and carefully, stirring continually bring to a boil. Once the water is added, mix the Besan /Chick pea flour mixture well so that no lumps are formed. Gradually Besan /Chick pea flour absorbs the water added and starts thickening. Thoroughly mix let whole mixture cook for 5-6 minutes more. keep on stirring so that the Besan /Chick pea flour halwa does not stick to the wok / Kadahi and starts leaving the sides. 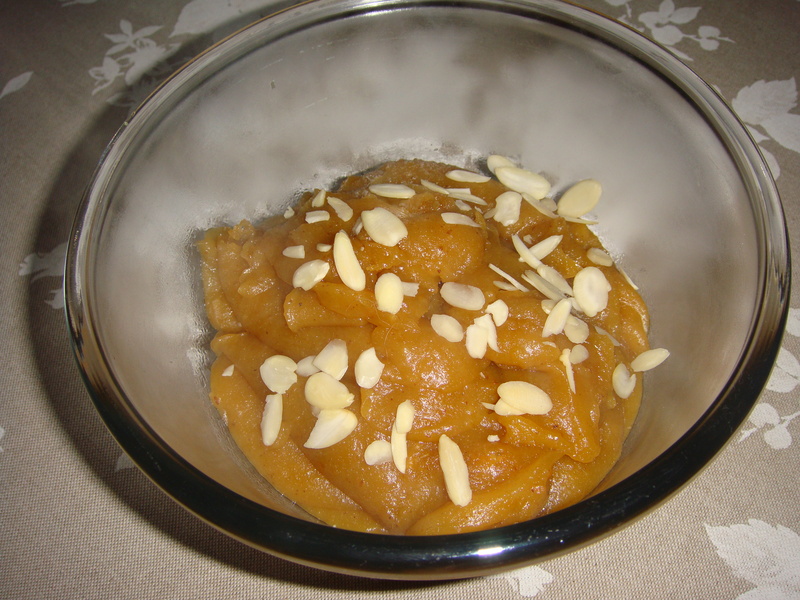 Besan /Chick pea flour halwa is ready now. Serve hot, garnished with the slivered almonds. Lowers diabetes- Besan is known to have very low levels of glycemic in it, which is great for those who have high diabetes. One can use the flour to make parathas and rotis, or replace the wheat flour to make desired dishes too. Lose weight now- Since besan has low glycemic index, the calorie count would be low too, which is why fitness freaks and experts swear by the consumption of besan, smoothie of besan is known as SATTU in India. Fights allergies- Besan doesn’t have gluten in it, which is grain and especially wonderful for those who have allergies to gluten induced foods. Besan flour is highly nutritious and helps the body with immense benefits, especially when fighting allergies of any kinds. Gluten free- Those who suffer from celiac ailments cannot have gluten, which is a protein. Gluten is found in barley and wheat extensively, but not in besan. Besan helps the immune system stay strong in the process, and the patient would be able to absorb all the nutrients as well as stay well nourished too. No more anaemia to worry of- The flour of besan helps with fatigue, weight loss and even iron deficiency in the body, and we all know when someone has low iron content in the body, they suffer from anaemia. Besan is also good for those who suffer from dermatitis herpetiformis, autoimmune disorders, sclerosis, autism, ADHD and more. As a body scrub, the flour of besan has been used time again since our grandmothers young hood days. To remove spots, back acne, body marks and oiliness of the body, try using the flour as a pack with milk and turmeric twice a week. This is a pack which would remove the tan and keep the skin healthy and fresh.